för denna artikel på svenska, klicka här. As soon as you talk about dogs or hounds whit someone that has an ‘old breed’ you will hear that it goes back into medieval times or longer. This might very well be true, or not true at all. 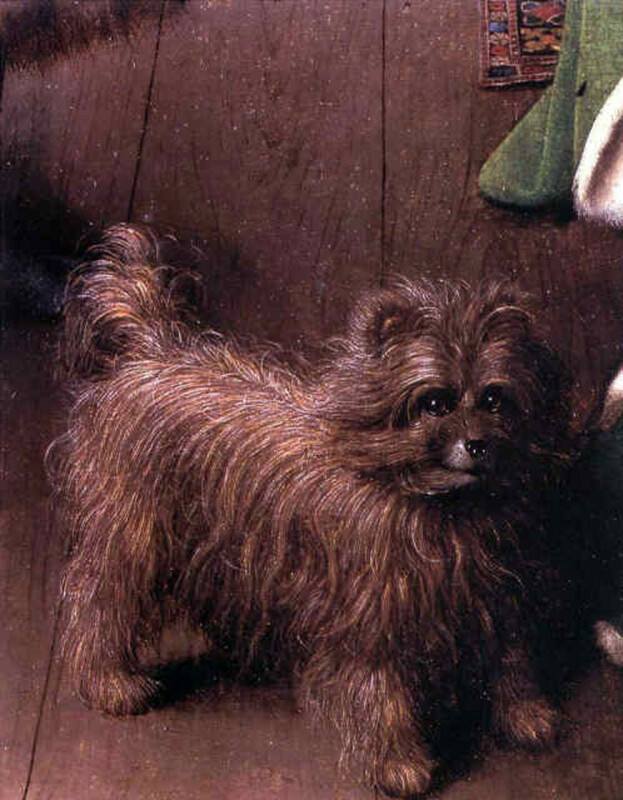 Dogbreeds as we see them is a relatively new thing, they hail mostly from the 19:th century, with some breeds getting bred in a ‘modern way’ already in 18:th cent. 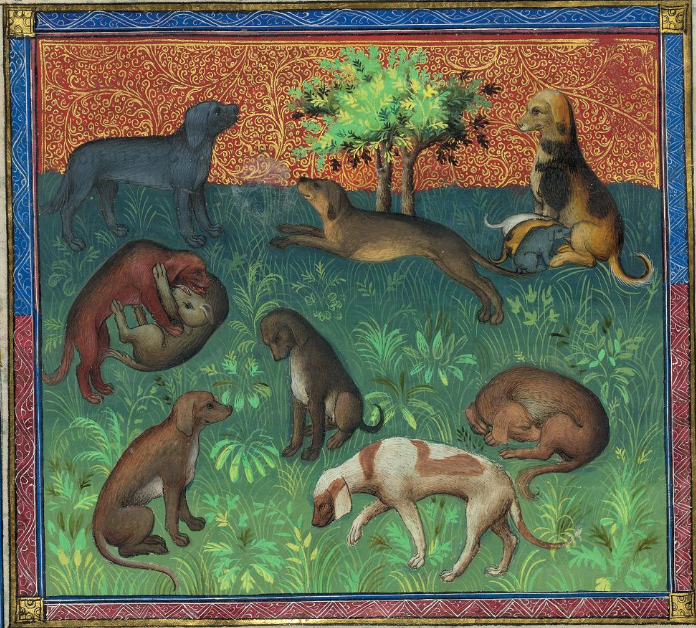 Earlier, and especially in medieval times, they had a much wider definition of ‘breeds’ if you could even call it breeds, they are more a family of dogs, with some subfamilies, maybe. Dogs where breed for a purpose mostly. The thought of connecting a certain look to that purpose is a not new one in breeding though. Breeding for purpose will give a certain look of course. But just because there was a ‘mountainregion X sheephound’ and there is a dog breed called the same now, doesn’t mean it is the same looking breed as 700 years ago. It just means a shepherdsdog that is in use in the region. 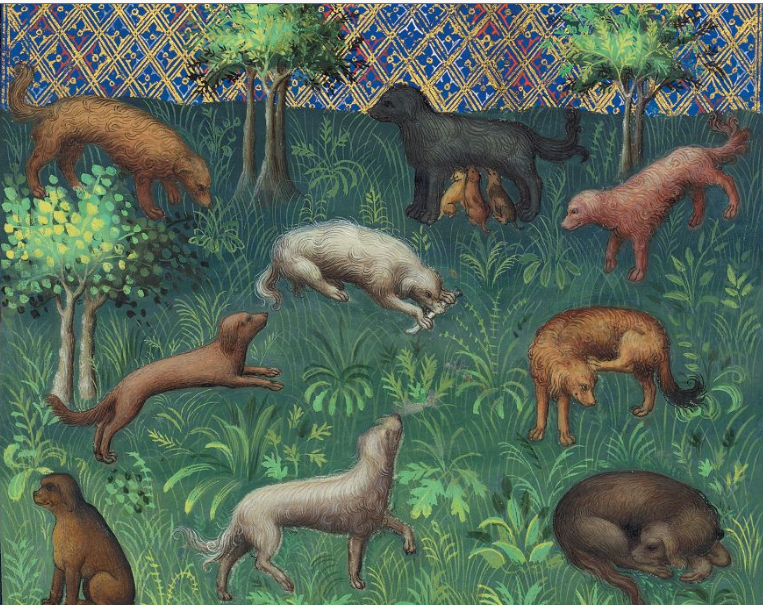 So, what DO we know about the medieval dog? They are described in the huntbooks and there is quite a lot of dogs depicted in art and literature. Most look like a middle-range dog with floppy ears, a bit like a golden or labrador maybe. Most are short-hairs and they have a wide range of colours. The dogs where often handled by doghandlers, valet de chiens, or berners, as they where commonly called. This article will just deal with the types of dogs, the relation between dog and man, the actual doghandling and the Equipment around the dog will have to wait until a later article. The lymer was a scent-hound that was used to locate the prey. They where trained to be silent and was held on a leash, lyme. One could maybe compare these with the more modern bloodhound. When the game was moved the raches was released after it and the job of the lymer was essentially done. But it was advised to let the lymer run along after the pack. If the pack lost the track of the game the lymer could be brought up to help recover it. The name raches probably comes from the old norse word ‘racki’, a word for dog. It is still in use but these days more used derogatory like ‘mutt’. Phoebus ranks the running hound highest as he saw them as having unique qualities. These are the hounds of the pack. They are released after the prey and chase it by scent and sight. They are often a driving dog that drives and exhaust the game with barks. They where preferable set out in packs of twelve or twenty-four. “the more hounds, the merrier the music they make” as Edward so eloquently puts it. They where often leashed together two and two, coupled up, or released completely. when let loose it seems common to take the collars of altogether. One often see the berner with several collars hanging over his arm. Possibly this was done so the hounds would not catch in the vegetation and get stuck. The raches was not allowed to change game during the hunt but was made to keep to the one that was appointed as prey. These hounds are almost always shown as smaller to mid-size dogs with hanging ear, spotted or plain with short hair coats. There are some subgroups mentioned here such as ‘kennets’, smaller dogs, Harthounds, that excelled in hunting harts, and so on…. 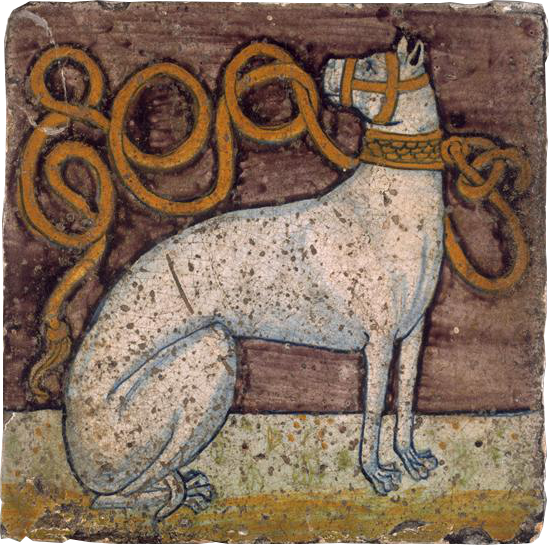 The Talbot, known through heraldry was originally a common name to name the dogs. After a while it was becoming synonymous with bigger slower hounds. A ‘real’ Talbot was supposed to be white. ‘Greyhound’ is a broad term in the 14:th Century, denoting all sight-hounds, from small Italian Greyhounds to big Irish wolfhound like hounds (in French the big greyhounds was nominated: Levrier d’attache, the small nervous ones petits levrierpour lievre. Greyhound was Levrier) . The Greyhound was valued and was often kept in the castle instead of out in the kennels. A nobleman was said to be recognized by “his hawk, his horse and his greyhound”. They where used in relays of three (usually in three relays) and was set loose on the game as the raches drove it past them. They where often the ones pulling the game down, and the one finalling the hunt by doing this was called ‘parafiteur’ . In the pictures short-hair, and often spotted Greyhounds are mostly depicted. 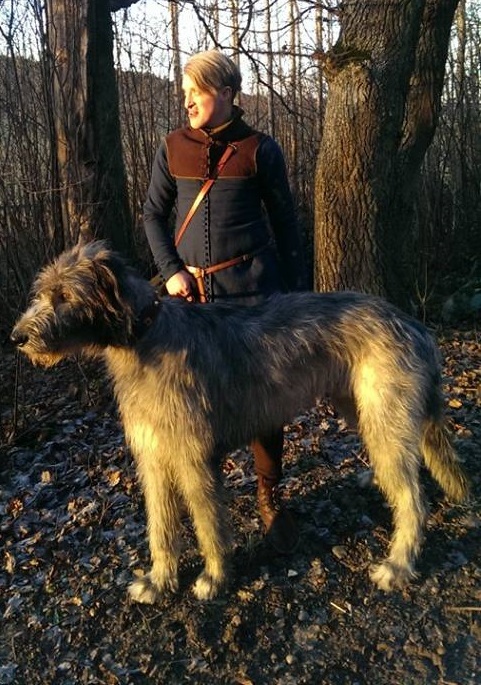 But Edward describes them to have “full hair under the cheeks, like a lion” witch rhymes better with a longhaired sighthound, like a wolfhound. The berner in charge of greyhounds seems to sometimes be referred to as a ‘veltrahus’, a word that goes back on gallo-latin. In English they where refered to as a Fewterer. The spaniel was a bird-dog. It was so called spaniel because its breed originated in Spain. They where used to flush out birds from bushes, mostly quail and partridge. Phoebus complained that spaniels lacked discipline, barked too much, and had so many other faults that he used them only when he had the goshawk, falcon, or sparrow hawk on his fist. 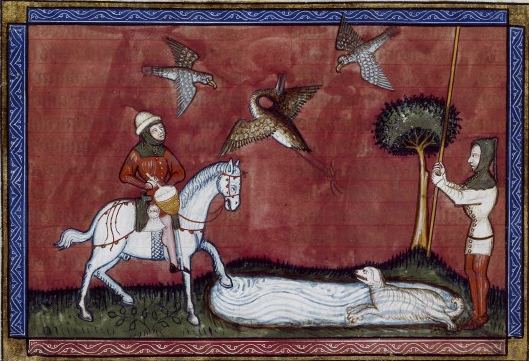 Edward also has nothing good to say about these dogs, but that might be due to him not being a big fan of falconry. He say that they are probably good dogs but share to many characteristics with their landsmen (in his words – not ours). He does say that they may make good berclettis (berclettis are shooting-dogs, dog you use when your hunting alone with bow). 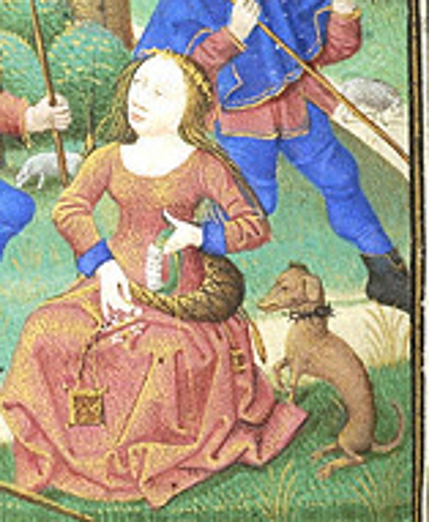 A spaniel in le roi modus et le reine ratio. The spaniel is mostly shown with curly hair and long ears, much like they look today. 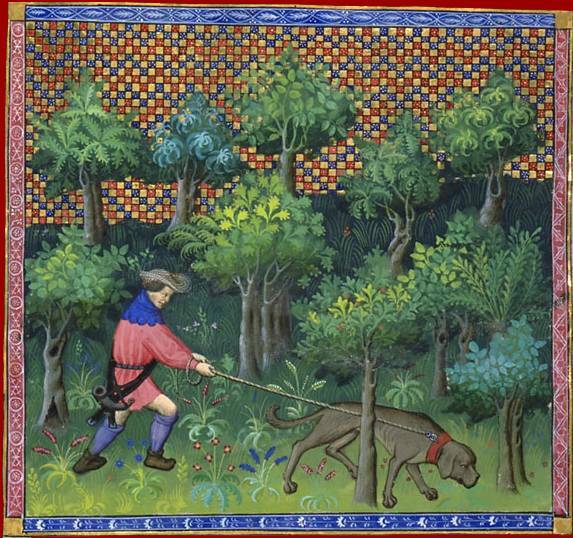 Edward Thinks it might be a good dog for those that just hunt meat for the household. In some ways they seem to share characteristics with the alaunt, but have more guard-instinct in them. Bullen the boarbaiter, ready to let loose his frenzy. They do not have to be as big as the mastiffs of modern age, although some was. But smaller ones, like Staffordshire terrier would also have been grouped in here, or possibly in alaunts. they run at oxen and sheep, and swine, and at all other beasts, or at men or at other hounds. For men have seen alauntes slay their masters. In all manner of ways alauntes are treacherous and evil understanding, and more foolish and more harebrained than any other kind of hound.” They are said to be very good at holding game, but need the assistance of Greyhounds to catch it. The are refereed to as ‘Mastiffs’ also and it seems they share many of these dogs characteristics. They bring to mind something like a great dane. 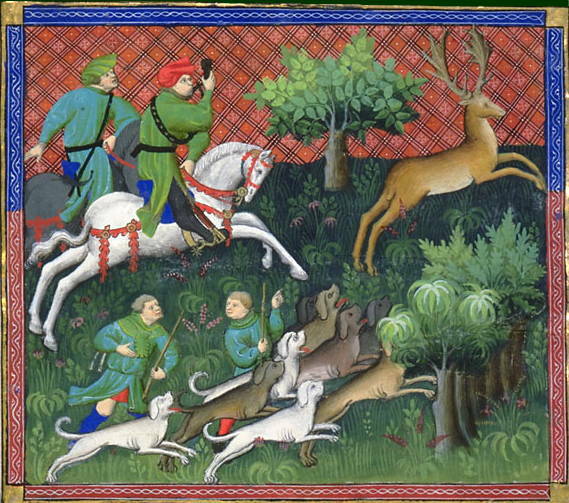 Edward advises that these might be send in after boars that have taken to hiding in thickets “…if they be slain by the wild boar or by the bull, it is not very great loss”. It seems that the alaunt is a breed that if they are good was very good, but was a hard breed find good examples in. Contrary to Greyhounds that seems to have been thought to be generally good. Lapdogs are small dogs that are mostly held for companionship. 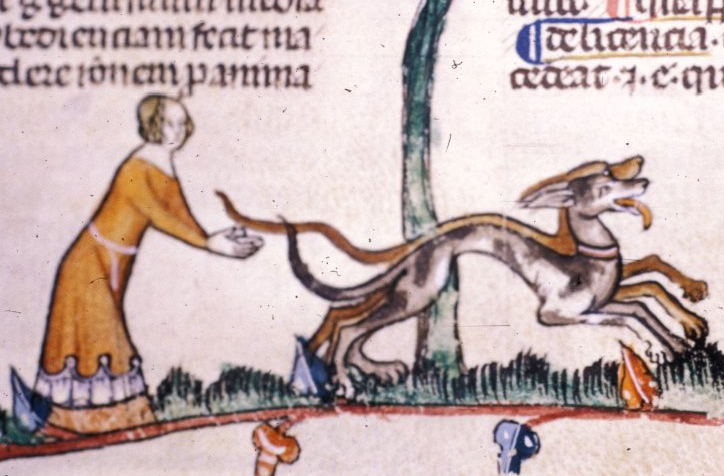 a medieval classifiaction was ‘a dog that a man can encircle its neck with one hand’. 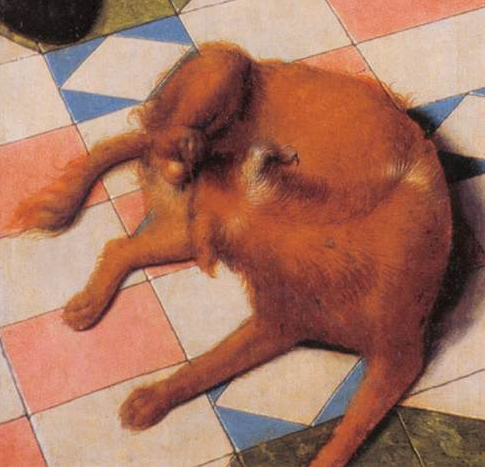 there is a plenitude of dogs here the most famous being Van Eyucks little fellow in The Wedding of Arnolfini. One might think that these small dogs where not held in high regard in this age of hunting and maschisomo, but in the law of Sörmland (county in Sweden) the fine for killing a lapdog was the highest. Even higher than for Greyhounds, but in Östergötland (another of the counties) only if the owner could prove that it had never bitten anyone. It is said that the wife of Bo Jonsson, the wealthiest man in the history of Sweden, is said to have been saved from bad men just because of her lapdogs inscessive barking. A dog she allegedly had in her sleeve. Bärsaracki just means ‘huntingdog’ (bärsa means hunt, and racki is the same word as Rache=dog). These could have been any kind of dog, looking any witch way. But in some areas, like Sweden and Norway (Finland is also Sweden in medieval times), spitze dogs have always been popular and you can trace their bones back to bronze-age in these parts (Norwegian elkhound, jämthund, Finish spitze, or similar kind of dogs are very old breeds) . They keep being a common find in archeological evidence throughout the middle ages, and still are very popular as huntingdogs here. These are probobly just called Bärsaracki (huntingdog) here but thinking about how they are as a dog it sounds probably they where mostly used as berclettis (dogs you use when hunting alone, with bow ). The big hunts might not have been as popular here as on the continent, and most laws concern hunting with traps. 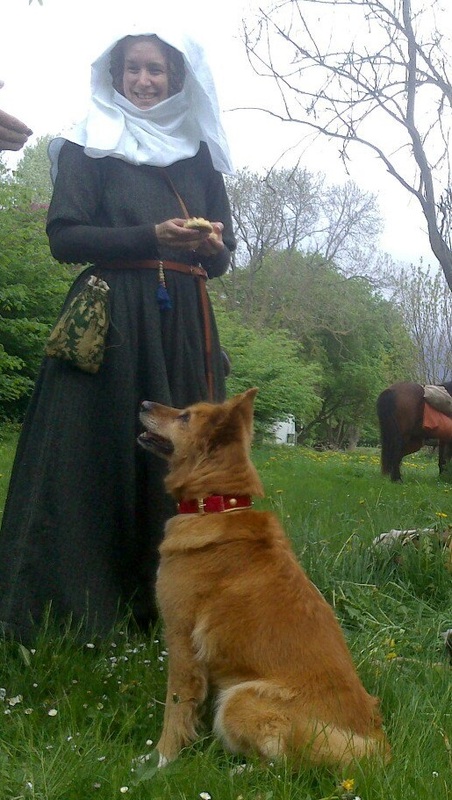 If the dog is part of your reenacting, you might like to have a ‘medieval dog’. What you want here is of course not a set thing. The dog is a living thing and should not only be bought because it is ‘right’, you need have a dog that fits your purposes, so that the dog can be happy. 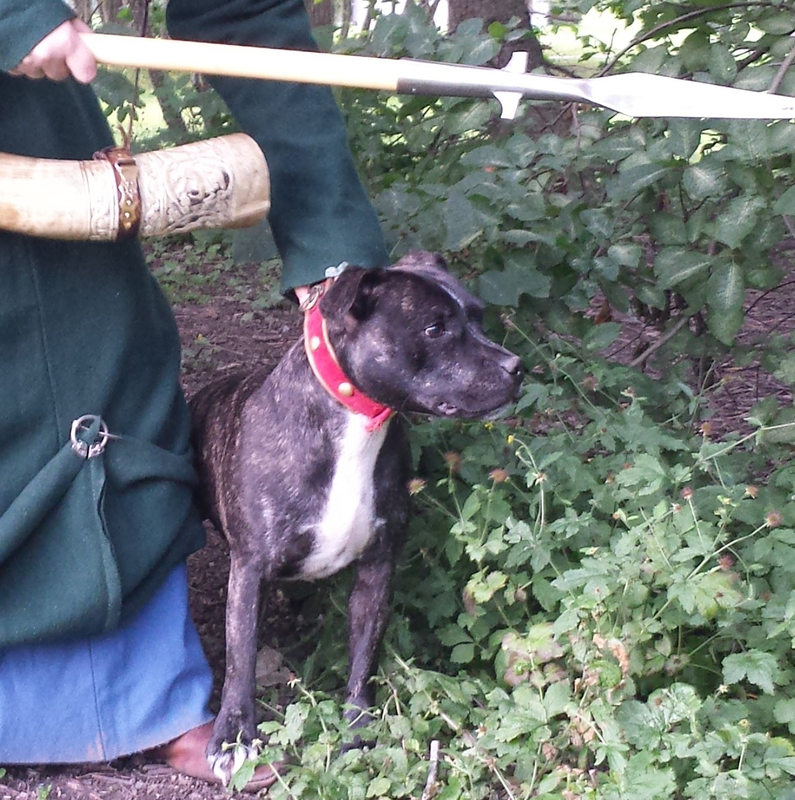 If you are planning to do actual medieval hunting, you dog should of course be able to do that while looking the part. 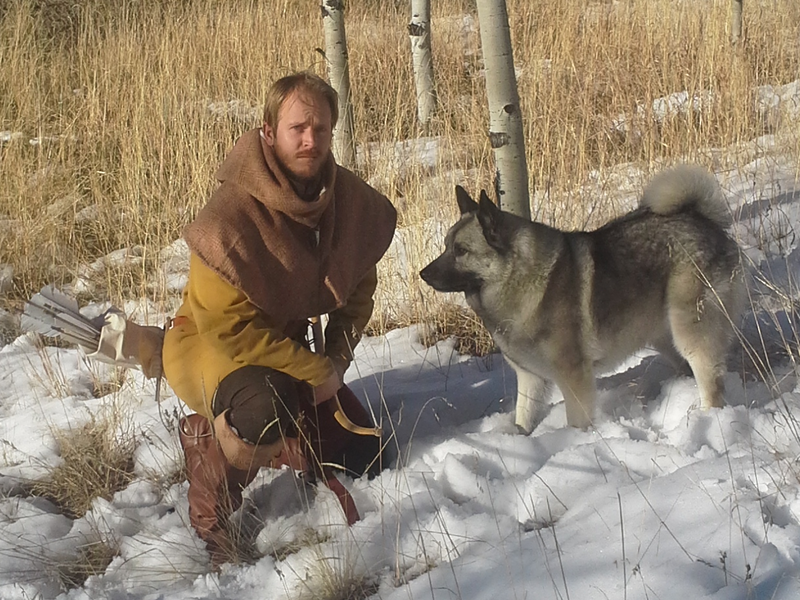 If you are not doing actual hunting, then it will only have to look the part. A labrador or a Golden retriver for example, looks rather much like a rache, but thier job does not though. As you did not shoot birds but used falcons, retriving dogs was not needed. If you only want a dog that hangs around you that dont look modern, then they will be fine. As a finale to this article, I bid you a picture of a dachshund, with a wolfcollar. From 15:th century.